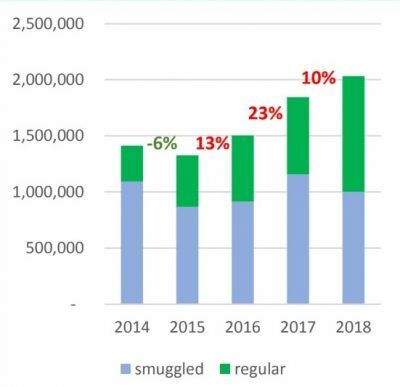 SUCCESS by Chinese authorities last year in closing down ‘grey trade’ beef entering the country illegally through neighbouring Hong Kong and Vietnam has been reflected in record ‘front-door’ imports, which are likely to exceed one million tonnes in a calendar year for the first time. A shift in meat supply and demand caused by the outbreak of African Swine Fever in pigs in China last year has also contributed to growing beef demand, analysts are now suggesting. For the 11 months to the end of November, China’s total direct beef imports reached 934,800 tonnes, and with December trade brisk in the lead-in to Chinese New Year, analysts are confident total annual volume will easy exceed one million tonnes. Imported beef trade for the first 11 months of 2018 was up 36 percent on the same period the year before (689,000t). China now ranks only behind the US as the world’s largest customers for imported beef, according to USDA figures. While Australia has lost considerable market share in China over recent years as the imported beef market volume has exploded, in absolute terms our exports continue to grow strongly. Australia’s trade to China last year reached a record 162,000t, up 47pc over the 110,000t the year before. Chinese analysts Meat Import Group suggest that for the first time last year, legitimate front-door beef imports to China (1.03 million tonnes, including an estimate figure for December), exceeded illegal grey channel imports (1.002mt, down 13pc on the year before) for the first time. In earlier years, smuggled beef volume was often twice that of direct imports, to escape taxes and supply restrictions. 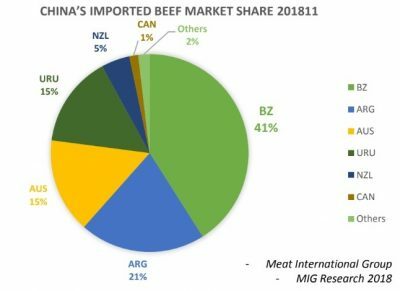 “This indicates that, as Chinese government cracks down on grey trade, more imported beef is being consigned through the direct channels,” MIG said in a recent report. When legitimate and grey-trade imports are combined, China imported two million times of beef for the first time last year. Despite this 10pc rise compared with the year before, it has not led to oversupply in the Chinese beef market, MIG said. “Despite the 48pc rise in average monthly imports last year, the meat market remained in balance,” it said. “This is because the total import supply of Chinese market only increased by 10pc, while the annual natural demand growth rate should be 20pc, according to our forecasts,” MIG said. The MIG report suggests there had been no evidence of a collapse in meat prices, despite China’s rapid growth in beef imports. It said large corporate investment in the Chinese beef supply chain had contributed to demand rises, and hence supported prices during 2018. Largest Chinese beef importer, Optimise Integration Group, in November accounted for 12.32pc of all Chinese beef imports for the month, while second largest importer, COFCo Meat Holdings, held a 5pc market share. As an agent, rather than a direct importer, Optimise was attracting an increasing number of end-customers because of their low-cost trade financing services. In total the top 20 Chinese importers accounted for more than 54pc of total imported beef trade in November, up 3.2pc from the previous month. There are now significantly more direct importers than agents among the top 20 Chinese importers. In terms of market share by volume, Brazil easily dominated beef exports to China in November, accounting for 41pc of total trade of 104,278 tonnes – the highest monthly volume in history. Next largest was Argentina with 21pc share, Australia and Uruguay (15pc each), and New Zealand with 5pc. A growing list of smaller export countries included Canada, Costa Rica, Ireland, Chile, Belarus, Ukraine and France. “As the China-US trade disputes continues, US beef exporters to China are rarely cost competitive due to high tariffs,” MIG’s report said. “But if the trade tensions between the two countries de-escalate, the US could possibly get more market share of China’s high-end grainfed beef market, which is currently dominated by Canada and Australia,” it said. As the Chinese Spring Festival high consumption period approaches, the volume of ribeye cuts imported in November grew by 53pc, in order to meet demand during the festival for family consumption and gift-giving. “Beef boxes have become a new favourite in China as holiday gifts, and sirloin and ribeye are ‘must’ choices for any beef box,” MIG said. US beef market analyst Steiner Consulting in its weekly imported US beef market report said the emergence of China as a major beef buyer had now dramatically altered the global beef market. “Meat buyers in the US are aware that at any time, Chinese buyers could assert themselves and clean up available supplies (out of countries like Australia),” Steiner said. “Lean and extra lean beef (like that traditional exported from Australia to the US) is no longer immune to Chinese competition. In the past Chinese buyers would mostly focus on purchasing cheaper fat trim, but that no longer is the case and, according to some participants, Chinese buyers are now starting to bid on lean bull meat as well,” Steiner said. China and Hong Kong currently account for almost half of all export beef shipments from South America. Much of the recent increase in Australian and New Zealand beef exports has also gone to the Chinese market.